When I mentioned the city of ’s-Hertogenbosch had forgotten to clear one new cycle route of snow in my post two weeks ago, the city quickly responded and the route was gritted right away. For the future the route is now included in the ‘to be cleared main cycle routes’. That was possible because the ‘city’ is of course a number of people working hard. One person read my post and contacted another person who is in charge of planning the actual gritting. 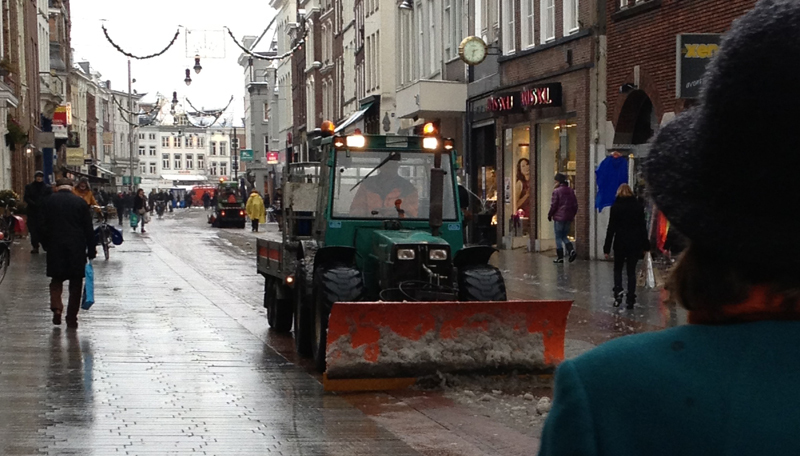 A few days later I was contacted, and asked if I’d like to have a look at how ’s-Hertogenbosch works to keep its city streets safe, by clearing the main routes for motorised traffic and those for cyclists of snow and ice. Well, yes of course I was interested! Left the original gritting map shows the missing link. Right: this is the newly constructed cycle route through a residential area that will be gritted in future. And so there I was, at the Department of Public Works, to talk to Hans Teeuwen, sanitation specialist, responsible for policies, purchasing and maintenance. Who told me all about this job of getting the streets cleared with an inspirational enthusiasm. I had no idea there was so much to it! Hans explains there is a policy to keep certain routes clear. Since all streets in Dutch cities are categorised (also because of the ‘sustainable safety’ policy) it is very clear which streets are main routes that must be cleared. In the past, the cycle paths were not really thought important. But there were many complaints about it and the policies shifted slowly towards clearing the cycle paths more as well. 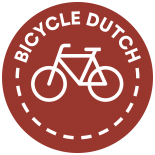 Hans: “Especially when the city was elected Cycling City of the Netherlands in 2011, the department of public works felt it was our moral obligation to give the main cycle routes the highest priority. Now the cycle paths are cleared at the same time as the 8 main routes for motorised traffic.” Nobody told the department to do this. But when a city gets an award it wants to show it really earned it and apparently this mechanism triggers decision makers on many levels in that city. Also of highest importance are the streets leading to the police and fire departments, the route to the hospitals, the bus routes and last but not least the routes for trucks carrying dangerous goods. You don’t want them to slip off the road of course. But that was one of the things you wouldn’t immediately think of when you are not an expert. The city has decided that the main routes must be cleared within three hours. To make that possible there is an array of measures in place. First of all the weather is constantly monitored. Hans shows me his computer. 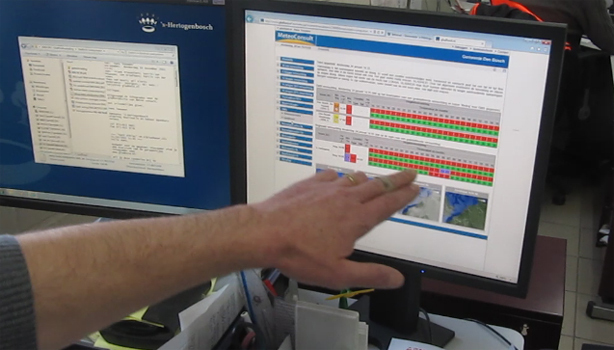 A weather service created an online real-time service customised for the city of ’s-Hertogenbosch. Hans points at graphs with the current temperatures of the air and the roads, the dew point and wind force. There are two measuring points in the city. Sensors in the road surface that send information of the road surface temperature and even the percentage of salt on the surface. In 2009 a vehicle with infra-red sensors drove all around the city to measure different types of road surface to find the two coldest points in the city. The sensors installed there now function as “pit-canaries”, an early warning system. All this information, combined with weather reports from nearby airports and a specific weather forecast that the city receives every afternoon, makes it possible to precisely decide when to send the vehicles onto the streets. For this decision the city has always someone on duty, 24 hours a day, 7 days a week from October to March. Five people take turns to cover that entire period. The vehicles must be out and about, before the roads get too slippery by either snow or ice and also before rush hour. The city also has contacts with Rijkswaterstaat (the National Road Service, who do the National roads) and the the province (who do the so-called provincial roads). If one of these two sends their vehicles onto the road the others get warned. The city in turn warns the smaller towns in the vicinity, which cannot afford to have such a sophisticated system themselves. The weather reports appear real time on the computer screen, fully customised for the city of ‘s-Hertogenbosch. Hans further explains: “Big trucks do the main roads. They usually have a plough (snow blade) in front and they spread salt from the back. The type of salt we use is actually brine; Sodium chloride (NaCl) with water. These vehicles are normally prepared in advance. The same vehicle may be used to water trees in summer but in winter the snow plough (blade) or a brush and the gritting installation are installed onto it. It is most important to get snow and drab off the surface as quickly as possible before it freezes to the road. Then the road surface must be covered with salt and that keeps new snow and ice from getting on to that surface and sticking to it. In the past dry salt was used, but in 2010 the Netherlands was taken by surprise by a very severe winter. That led to salt shortages throughout the winter all over the country. Forced by circumstances everybody got very inventive. From then on gritting was done with a mixture of brine and water. According to the type of ice or snow, the mixture sometimes contains only 22% salt. This wet salt sticks much better to the road, so it can do its job, melting what is left after brushing or shoving the initial snow away, much better. It was thought this would only work for temperatures to -8C but forced by the shortages it is now known snow and ice even melt in temperatures as low as -20C with this method.” Having less salt on the streets also sounds like good news for the environment. Today’s methods are so sophisticated that the roads can be cleared with just 7 grams of wet salt per square metre. In the Netherlands nobody uses sand or gravel to grit the roads because salt washes away but gravel or sand has to be removed in spring. Large trucks clear the streets of snow and ice. Main routes are gritted in the night if necessary. The cycle paths are cleared with smaller vehicles. 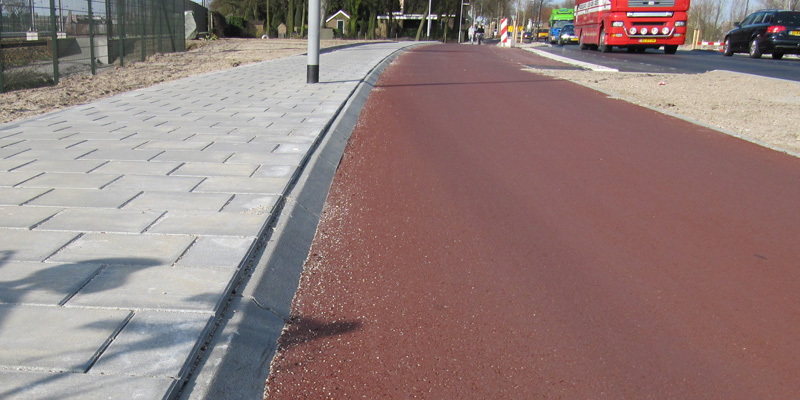 They are 2.2 metres wide so they fit on the 2.5 metre wide cycle paths and they can make the tighter turns. The department is very happy with the new kerbs (curbs). The 45 degree angle is not only safer for cyclists but it is also easier to drive over these kerbs with a maintenance vehicle. Especially where the curves are a bit too tight even for these smaller lorries. Having no bollards is also better for both cyclists and maintenance vehicles. Most bollards are taken down all of the winter period (October-March) so you can ask the question why you should have them up again in the rest of the year. Not having them up again would lower the number of accidents of cyclists smashing into the bollards. This is being discussed in many municipalities all around the Netherlands right now. 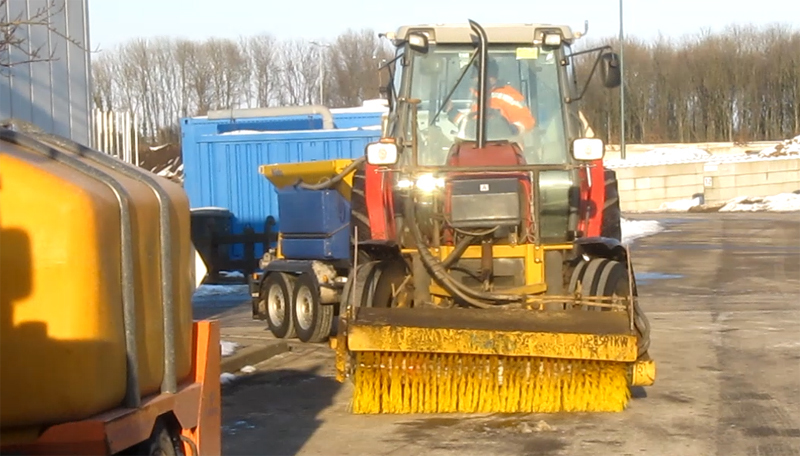 This type of gritting tractor is used to clear the cycle paths. The rotating brush at the front and the impeller that spreads salt from the back require so much hydraulic power that there is an extra engine on the tractor. Only after the level 1 main routes (both for motorised traffic and cycling) are under control (which can take driving that route up to three times) the second level of routes is cleared. These are mainly streets on industrial areas and office parks. Once they are done, the third level of streets gets attention. Pavements in shopping streets, those near homes for the elderly or schools. For these pavements the city has much smaller vehicles. One route for pedestrians belongs to the level 1 main routes: the pavement from central station to the city centre. Level 1 routes are cleared in the middle of the night if necessary. But level 2 and 3 streets are only cleared during normal working hours. Pavement gritting is done with smaller vehicles that don’t damage the pavements (side walks). Pavement gritting is only done during normal working hours. I was impressed when Hans took me to the huge number of (different) gritting vehicles the city has. The three large salt depots combined contain up to 1,500 metric tons of salt and they are obviously huge too. One was entirely empty already, but one was still full. Hans sounds confident when he says: “We have enough salt for the rest of this winter”. So I had to ask Hans: “What does this all cost?” “The city has a specific budget for clearing the streets in winter. For all the costs, including maintenance to the vehicles (and damage to them), salaries of the drivers, and the actual purchase of salt, but without the purchase of the vehicles, the budget is 250,000 euros per year.” Which, for a municipality with a population of almost 143,000, sounds very efficient. 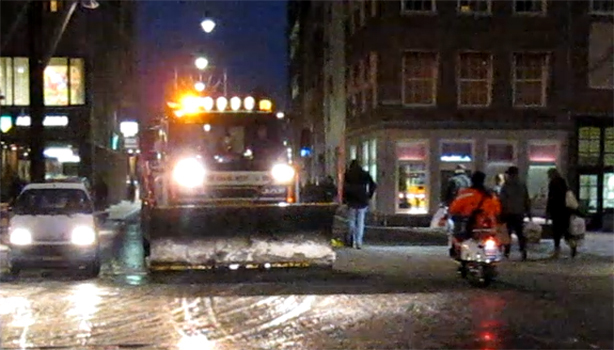 The video shows how the city of ’s-Hertogenbosch organises the clearing of the municipal streets. Excellent details about the amount of salt needed. A related problem is drainage and pooling of water in underpasses and tunnels. I’d welcome a post on whether this is a common problem or whether Dutch engineers design their infrastructure to prevent pooling and flooding. Thank you, that is a great idea for a post. The Netherlands has so much rain, there are so many rivers, ditches, canals, and there’s such an ongoing battle with the sea; that water management really is second nature. It is such a given that we ourselves don’t notice. But I will publish a post about it. He has published a post on this very issue. Look up Drainage. Great post to get some insight in how this winter maintenance is working. I’m living in Eindhoven and am very satisfied with snow clearing too. I did have some idea of how it all worked, but didn’t know cities actually had temperature sensors build in roads and people on stand by 24/7. However, not all bicycle paths are cleared in Eindhoven. In those cases it is clearly stated (all year long) on a sign at its entrance that no winter maintenance will be done, so you know that you might have to avoid those after have snow. But these cycle paths are not problematic (to me) as they are generally quite close to main routes which are cleared. Personally I actually like to cycle on roads which have a fresh layer of snow, it sort of feels like going of piste with a snowboard. The sound of the snow being crushed by your tires gives me a great winter feeling. Fresh snow is not at all slippery, but you need to keep your bicycle moving at a steady rate of at least 15 km/h. If you go the slow you will get ‘derailed’ by locally tightly frozen parts, while at a bit higher speed you just slice through. This is generally the case for ‘older’ parts of snowy routes and less for completely fresh snow on top of asphalt. There is off course a downside, after some time the snow is crushed to a pretty dense substance (more ‘derailing’) and in combination with a warmer day and a freezing night it becomes an icy circuit. That’s when the cleared route comes in handy. One of these paths is part of my daily commute, and I only took a detour once (when I was also carrying have goods). It was just getting more of a challenge to me to pass without gliding as a sort of extreme sport, but I definitely do not recommend it to everyone as the falls with be unforgiving. P.S. I’m also a bit happy about the snow being gone. Now I finally dare to ride my recumbent bicycle again. Thank you for this fine video and discussion. This shows why we, in the United States, are truly the “Ugly Americans”. Do I include myself in that category? No, I hope not. But what I love about Europe and especially the NL is your attention to detail and having appropriate technologies for the various modes of transport. We don’t. The car reigns supreme, and we have snow plows / salt trucks to clear highways and city streets. Each resident is required to clear their own property frontage (sidewalk) or be ticketed; I suppose that goes for business / office owners too. I don’t know what the District of Columbia plans for clearing public sidewalks not in front of businesses or residences. We don’t have so many bike paths here in the States, and no scheme for clearing them if covered with snow or ice that I am aware of. It is refreshing to note the new new urban bike lanes going North-South and East-West now built or in process of being built in Washington, D.C. I will investigate what is planned for clearing them of snow. Of course, the other issue is, with climate change, we have so much less snow lately to deal with, the problem may not be answered here in the Mid-Atlantic region. This entry was posted on 31 January 2013 by Bicycle Dutch in Original posts and tagged ’s-Hertogenbosch (Den Bosch), gritting, maintenance, snow, Winter.